This is a great general purpose boating knife with a stainless blade and a "marlin" spike. The wood handle and brass case, rivets, and shackle add to the quality. Also great for general use, as ranchers, farmers and construction crews have found the spike very useful for undoing cable and knots. Founded in 1925, A. E. Coltellerie snl has been creating great knives under the "Antonini" brand for more than three generations. The heritage of their location in the Maniago in northeast Italy, an area with a history of making knives, blades, and other cutting tools since Medieval times, provides centuries of experience and skill. Their present range of products are "working" tools, which consists mostly of folding pocket knives for agriculture, boating/fishing, and electrical/telephone/cable industrial workers and home hobbyists. 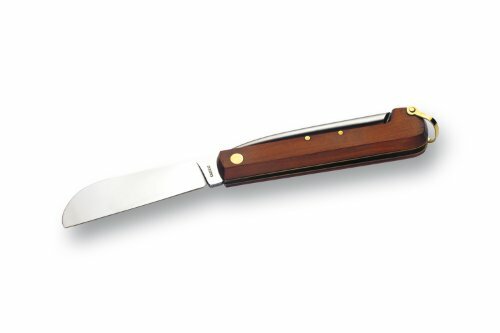 Also in their range are traditional pocket knives of Italy. They are also the original designers and producers of the "bullet" and "cartridge" knives, combining novelty with quality and usefulness. Their most recent expansion has been in a range of knives specifically designed for use in emergency and rescue operations, which have been very warmly received by Police, Fire, and rescue crews worldwide. You can be assured that the legendary "Antonini" label is one of quality associated with a family-owned company that still makes tools at their factory in Maniago, Italy. A. E. Coltellerie snl combines centuries of tradition and experience in metallurgy and knife-making with cutting edge technology and design, and they guarantee the quality of the materials and workmanship that goes into every knife they make. If you have any questions about this product by ANTONINI, contact us by completing and submitting the form below. If you are looking for a specif part number, please include it with your message.